Order the brown dress shoes that I like. 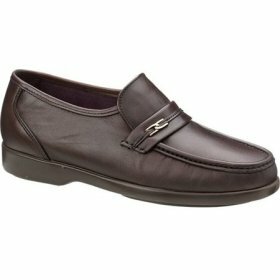 I own several pairs in black but need to order the ones in the color brown. I hate shopping for shoes and I'm definitely lacking nice brown shoes. So the guy at the Hush Puppies store said he could order them for me cheaper than I could buy on-line (and they were cheaper). I just wasn't sure what my size was (I always get confused if I like the 10 or 10.5 better) so I wanted to check my black ones at home. I'm definitely lacking nice brown shoes and I own several pairs of these shoes in black but need to order the ones in the color brown. I'll know I like them (this has been my standard black shoe for years) and I've been meaning to do this for ages so I added it to my 101 in 1001 list. So the guy at the Hush Puppies store said he could order them for me cheaper than I could buy on-line (which was true). I just wasn't sure exactly what my size was so I wanted to check my black ones at home. Then I found Boscov's they have the Sutton Hush Puppies in Brown and they were half off. So I ordered two pair! And I loved them. Did I tell you I hate shoe shopping? And that they don't make these any more? And they were brown? And they were exactly what I wanted? Guess what? I ordered 4 more!